The new robotic movers no longer need to travel fixed routes, as they can be programmed while on the move. Focusing on automated materials handling processes, and the underlying robot perception technology, companies will be employing this sophisticated, state-of-the-art artificial intelligence now and in the future. The concept of a driverless forklift is almost 60 years old. Back then, a driverless forklift followed an overhead wire. Today, high volume warehouses are stepping into the future, using driverless robotic equipment to assist with picking and moving operations. For many warehouses, there is an increased requirement for full case and layer picking, especially when making route deliveries. 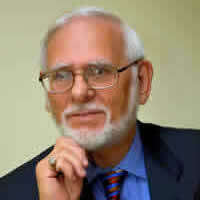 This is due to the increase in smaller and frequent orders. The result is that the warehouse operation is labor intensive and expensive. Add to this the increase of safety regulations and warehouse managers are faced with difficult picking solutions. By automating the layer picking process, warehouse operators can efficiently pick fast-moving SKUs by picking full layers of product at a time. And if there’s a significant volume of cases, a robotic layer picker might save people time. If you can do 10 times as much work with this piece of equipment for high volume items, then it pays off quickly. A robotic layer-pick system is a combination of a clamping tool and a large gantry that travels on two rails. Underneath the gantry is a staging area with a pallet. The layer picking tool uses a WCS to communicate with WMS and obtains order information, including SKUs, quantities, and picking sequences. The WCS then directs the layer-pick robot how to build orders and manage replenishment. Once the order is built, it is moved to the loading dock by a robotic pallet truck. Warehouses are typically setup with rows of fixed shelving where products are sorted and stored. 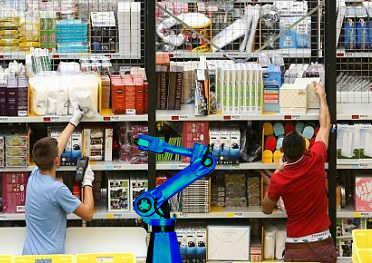 When an order is placed, a human picker will walk around the warehouse picking the products ordered. In some warehouses, pickers could walk up to 20 miles every day. A robotic picking system might both pick and pack, while in some situations, people and robots might occupy the same aisle, work on the same order, or specialize in the handling of certain SKUs. The order selector picks cases or pallets and confirms the pick in real time via a voice headset or RF handheld terminal that communicates to the warehouse management system (WMS) server. 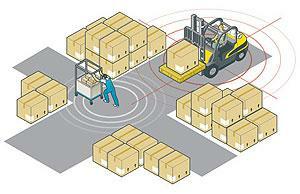 The WMS communicates to a warehouse control system (WCS) that controls the driverless robot; and the vehicle then automatically moves to the next pick location with the operator walking behind the vehicle. The big question is "are these pallet trucks and robotic forklifts safe?" Driverless pallet trucks and forklifts must comply with the same industry approved standards. They must be equipped with audible warnings and lights; and they must have built-in sensors to detect obstructions. These sensors can include lasers and/or camera systems. The sensors are positioned to detect objects and activity from the floor to specified heights and distances around all sides of the vehicle. They must also be capable of knowing when to slow down or stop to prevent a collision. The above-pictured Cisco-Eagle forklift is equipped with a ZoneSafe unit that has a single antenna; and the worker pushing the cart is wearing a ZoneSafe transponder tag. The forklift antenna creates a 360 degree detection zone around the vehicle. If the worker pushing the cart enters into the forklift's zone, an audible and visual alarm is set off inside the forklift cab to alert the driver to take precautions. Once the worker leaves the detection zone the alarm will stop. The vision guided robotic pallet truck frees warehouse personnel to perform more important jobs while cutting transport times. The forks are positioned under the pallet, the route is entered on a keyboard, and pallet truck transports the load to the precise location to be offloaded. All of this is accomplished without a pallet driver. A camera takes 3 pictures per second and creates a 3D map of each travel path with up to 25 miles of travel paths stored in memory. The pallet trucks and forklifts automatically move materials along pre-recorded routes without the need to interface to a WMS or WCS, and without any facility infrastructure such as magnets or reflective markers. An operator can reroute the vehicle any time as needed even when it's moving. LogiMover by Eisenmann is an interesting concept. It uses two independent forks, which are independent robots, to lift and move pallets around a warehouse or factory floor. 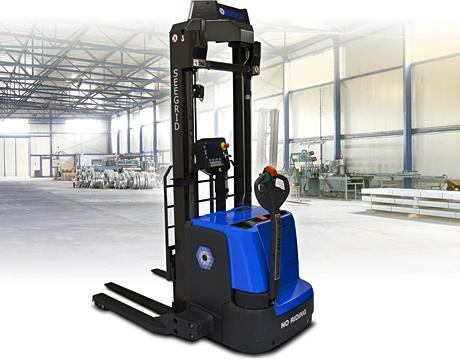 This system is not quite as versatile as a normal forklift in the vertical direction, but it is certainly compact. All drive components and the power supplies are integrated into the two tines, which move in parallel but are not physically connected. As there are no protruding or mounted parts, the tines are highly maneuverable, which saves space. Robotic forklifts and pallet trucks are not cheap; but warehouse managers are focusing on overall ROI rather than on the purchase price. For many warehouses, the productivity improvements from automation would more than offset any additional costs over manual lift trucks. Not all warehouses need robotics vehicles. The right environment for these vehicles is case pick-to-pallet operations, especially warehouses with a high pay workers or where labor is in short supply. Exceptionally large warehouses, which have lots of repetitive, horizontal travel with full pallets over long distances, or moving large numbers of pallets quickly are good candidates for robotic vehicles. Most driverless pallet trucks and forklifts are electric, and they come in a range of models, including sit-down and stand-up lifts, order pickers, turret trucks, and reach trucks. They also use a variety of guidance systems, including lasers, vision-based guidance, radio-frequency identification (RFID), and global positioning systems (GPS). Lean technology and process improvement, guarantees that innovation will allow for the automated transportation of materials to be faster, less expensive, more adaptable, and easier to make changes. The new robotic movers no longer need to travel fixed routes, as they can be programmed while on the move. Focusing on automated materials handling processes, and the underlying robot perception technology, companies will be employing this sophisticated, state-of-the-art artificial intelligence now and in the future.